November 30, 1933: The first Ub Iwerks ComiColor cartoons are released theatrically. March 23, 1939: Cinecolor opens their new laboratory in Burbank, CA. 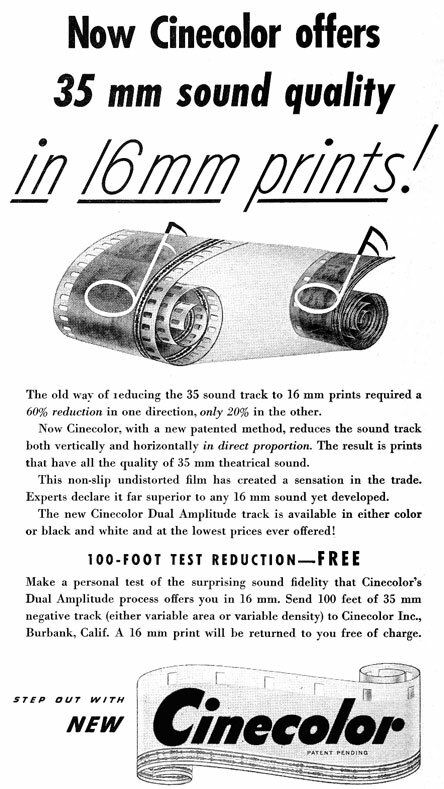 August 1940: Cinecolor offers 16mm prints with the new Dual Amplitude track. 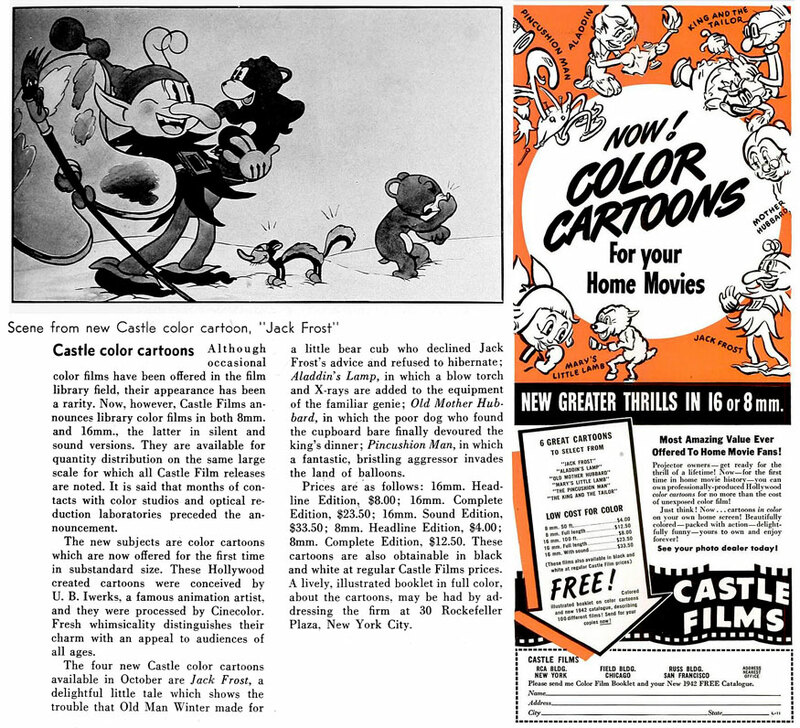 December 1940: Castle releases the 1938 three-color cartoon BOY MEETS DOG in black and white only. Around 1950, some prints are made in Kodachrome with the Castle logo but they are not available for sale in the catalog. 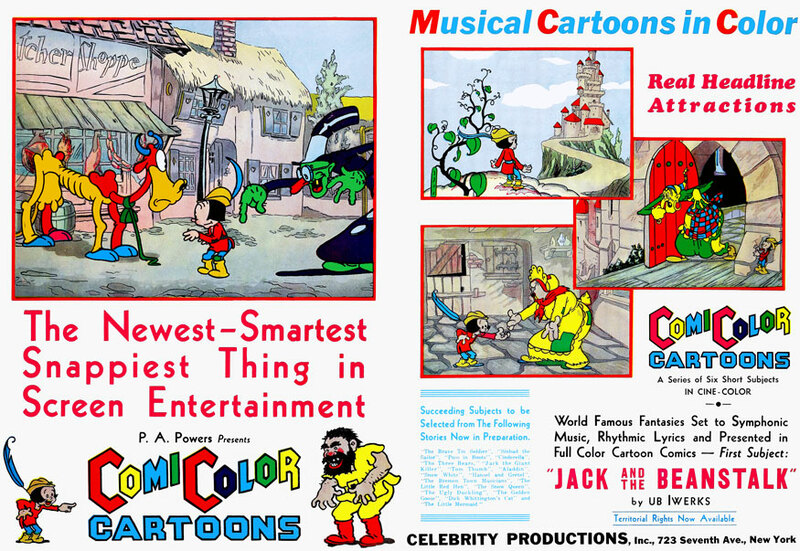 October 1941: Castle Films release the first six ComiColor cartoons in 16mm and 8mm editions. Here are the two boxes that were issued for the color and black and white versions of JACK FROST. November 1942: The second group of six titles are released. 1945 Castle Films catalog listing the twelve Fun Cartoons in Color. November 1946: The final three Cinecolor titles are released. 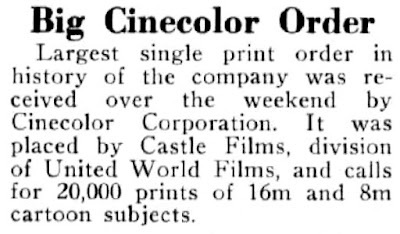 March 22, 1948: Variety reports on the largest single print order for Cinecolor. 1948 Castle Films catalog listing the fifteen Famous Fairytale Cartoons. converts their lab to three-color printing. They remain for sale in the Castle catalog until 1951. August 8, 1950: Columbia begins filming WHEN THE REDSKINS RODE; the first three-color Cinecolor feature. March 24, 1951: The first seven SuperCinecolor features are ready for release.